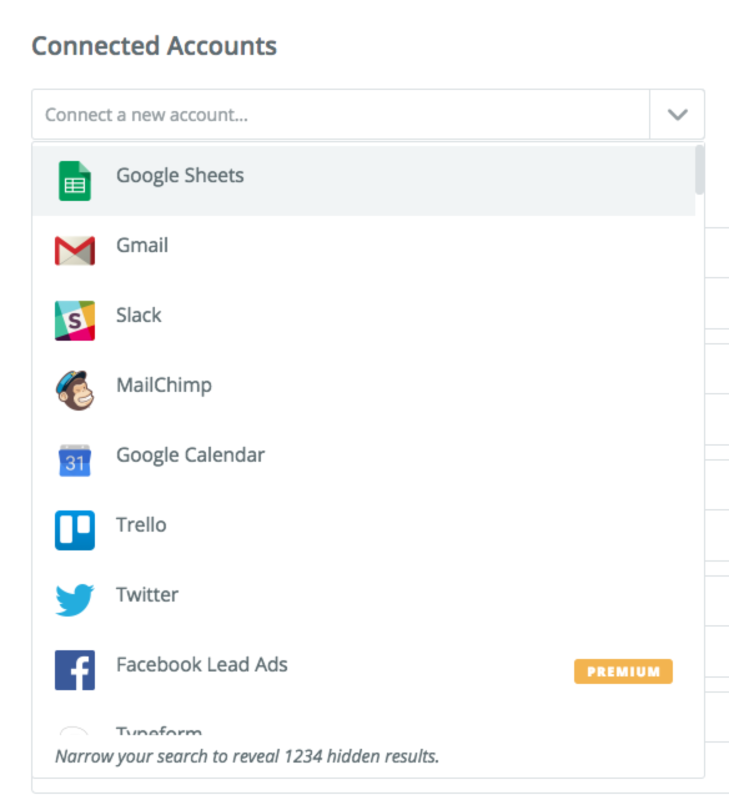 The Connected Accounts page is where you can see all the different services you have connected with Zapier. You can access it from the toolbar towards the top of the screen. 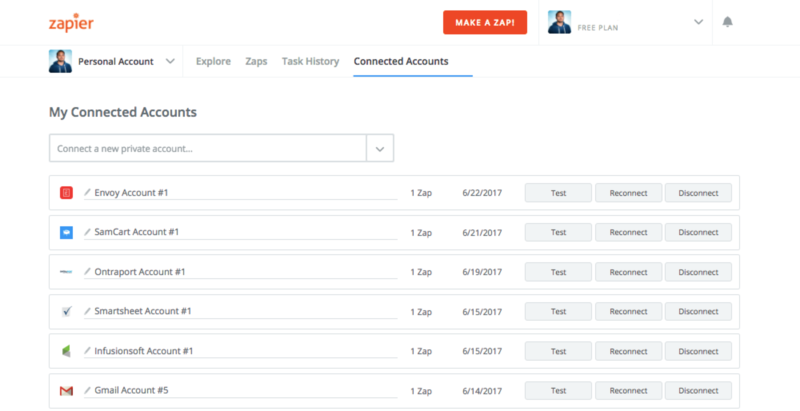 From this screen you can add a new account, view your currently connected accounts, view how many zaps each account uses, and rename, test, reconnect, or disconnect those accounts. The first option is to head to the Connected Accounts page as mentioned above, click on the "Connect a new account" drop-down, search for and choose the app you'd like to connect, and follow the on-screen instructions. The second option is to create a brand new Zap in your dashboard, choose the app you'd like to connect in either Step 2 or Step 3, and follow the on-screen instructions. Why can't I connect a 2nd account for my app? Why does it always add my original app account when I try to add another account? Usually, what happens here is that you currently have an open session with an app, i.e. you're currently logged in to the account. Therefore, Zapier uses that logged in session when adding a new account. Open an incognito window in your browser. 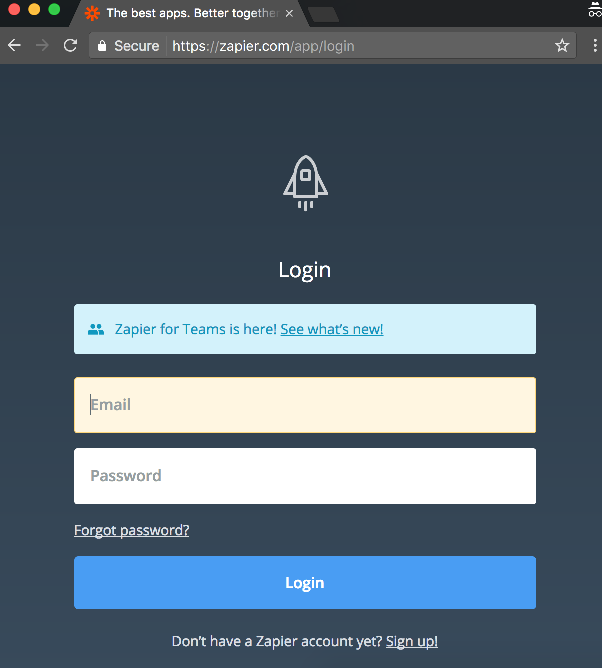 Login to Zapier using that incognito window. Navigate to the Connected accounts page (https://zapier.com/app/settings/authorizations). Add the app using the "Connect a new account" box. Since you're in incognito mode, there would be no open sessions/cookies for the said app. This should force the popup login to appear for that app. Add the correct login details for the 2nd app. Viola! The 2nd user login details should be added now. Don't forget to rename the connection using the pencil icon to help identify the new connection. Important to note: Even Incognito windows will hold on to your session information. If you go on to connect another account with these Incognito windows still open, it'll connect the same account you just connected! Close all open Incognito windows and start over again to connect your next account.